My loves! I know it's been a long hiatus, and for that I apologize, but I haven't forgotten you in the least! To bring you all up to speed, in my absence I moved to New York and began a new chapter in my life. I'm so happy here working and doing what I love, but it took a little time to transition. Anyways, I'm back now so let's get our fashion on! The Golden Globe Awards were on last night, and apart from Amy and Tina and a few highlights, they were mostly just very long. Regardless, there was some gorgeous fashion to be seen, so let's just skip right to that and celebrate these lustrous ladies! Emma Stone slayed in this Lanvin jumpsuit. I'm always excited to see what she'll wear on the carpet, and she didn't disappoint. Chrissy Teigen wore this beautiful blush pink Zuhair Murad gown, and absolutely glowed next to husband John Legend. Kate Hudson was not messing around in this Versace gown. The girl knows that she always kills when she wears white on the carpet, and why mess with perfection?! OBSESSED with Lupita Nyong'o in Giambattista Valli. She has established herself as a fashion icon in the last year, and I love her choices on the red carpet every time I see her. The color on this gown, and the floral texture was just divine. Simple but elegant, Reese Witherspoon looked every bit the screen siren she is in this metallic Calvin Klein gown. 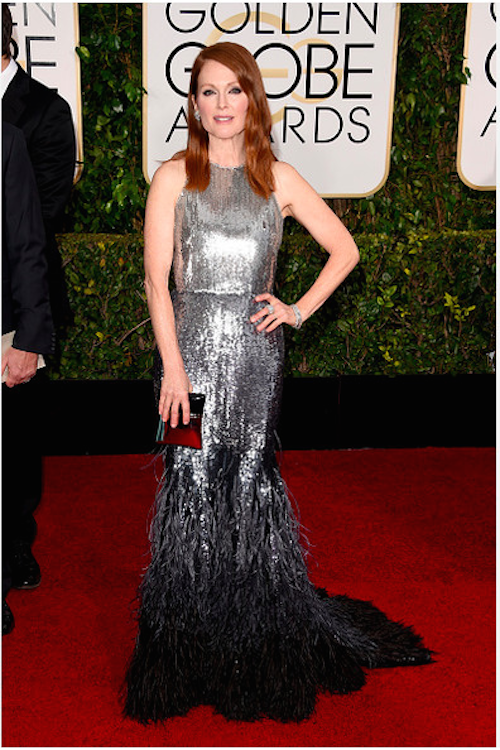 Julianne Moore has long been one of the women to always watch in fashion, and last night she wore that title well while donning this stunning Givenchy Couture gown. Miss Golden Globe, Greer Grammer, looked absolutely lovely in this ethereal Lorena Sarbu gown. Naomi Watts is always daring on the red carpet, and I loved this yellow column Gucci gown on her. Plus the serpent necklace was seriously on point. I mean, would we expect anything less than 100 from J-Lo? I think not, and she owned the carpet in her Zuhair Murad caped gown. I definitely could have done without Jeremy Renner's gross comment to her on stage, however. C'mon Renner, don't be that guy. Did anyone else mistake Salma Hayek for a heavenly angel?? She was breathtaking in this Alexander McQueen gown. This is how you win an award show carpet folks, take note. Winning the Golden Globe and having the sweetest and most moving moment of the evening was Gina Rodriguez. And she looked every part the winner in her Badgley Mischka dress. So much love for this one! I must say, Giuliana Rancic has yet to disappoint me in her red carpet fashion game. I'm always completely taken by the gown she wears, and this event was no different. She wore this STUNNING lilac mermaid dress by Maria Lucia Hohan, and it's simply divine. Love love LOVE. So there you have it BBs, my choices for Best Dressed! Who were your favorites?? Let me know! And if you haven't already, be sure to follow me on Instagram as well: @blushandbangs :) Love you guys!